The subject of management information system (MIS) has different meaning for different people. The concept of MIS has evolved over a period of last two decades or so. The initial management information systems were built to process transactional data of an organization and to produce regular reports. The reports were not targeted and individuals picked the required data from the report. The information systems evolved further and produced different reports according to requirements. Instead of user looking through the report for required data, the system generated a report in a suitable format that created an impact on its user and provoked an action, a decision or an investigation. Today, an information system has evolved to the stage where they handle databases and facilitate decision-making. Accordingly, definition of MIS has also evolved. There are many closely related definitions in use. The terms MIS is synonymously used with terms the Information System (IS), the Information and Decision System and the Computer based Information System. The MIS is defined as an integrated system of man and machine for providing the information to support the operations, the management, and the decision-making function in the organization. The above definition emphasizes an association between MIS and decision-making. An application software that processes data, which is not used for decision-making, cannot be called an MIS. For instance, a computer-aided design system is not an MIS. An MIS deals with information that is systematically and routinely collected in accordance with a well-defined set of rules. In other words, data collection is a planned activity for which resources are allocated and rules are defined. The information provided by an MIS assists managers in planning, organizing, staffing, coordinating, directing and controlling the operations of an organization. The management experts have viewed these steps as Management Control system. 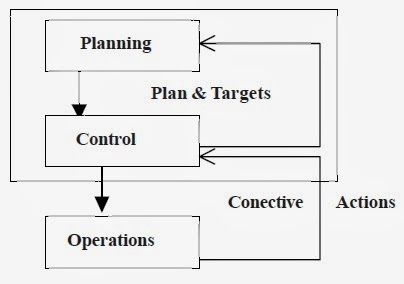 The following figure shows relationship between operations, planning and control. In any organization that has planned activities leading to the achievement of the stated goals, there is always a control process in place that measures progress towards these goals and enables the manager to deduct the deviations from the original plan in time. It is the responsibility of the management to take corrective actions before it is too late. The deviations may be due to environmental changes or due to the mistakes made by people. An MIS is concerned with planning and control. An MIS has large amount of data as its integral part that is stored and managed by a data base management system. 1) It must be capable of handling voluminous data. The data as well as transactions must be validated. 2) It must be able to perform operations on the data irrespective of the complexity of the operations. Often multi-dimensional analysis is required. 3) An MIS should facilitate quick search and retrieval of information. An MIS must support mass storage of data and information. 4) The information must be communicated to the recipient in time. Moreover, the communicated information must be relevant. 1) Strategic Planning is the process of deciding objectives of the organization, determining the possible shift in objectives, deciding on the resources used to attain their objectives and the policies that govern the acquisition, use and disposition of their resources. 2) Management Control is the process by which managers assure that the resources are obtained and used effectively and efficiently to attain the objectives of the organization. 3) Operational Control is the process of assuming that specific tasks are carried out effectively and efficiently. It is useful to classify the above definitions with some examples. 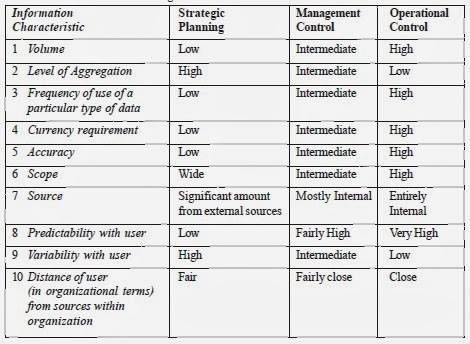 The table below gives instances of planning and control activities in different functional areas. Anthony’s framework enables us to understand the characteristics of information needed to support the three types of planning and control process. 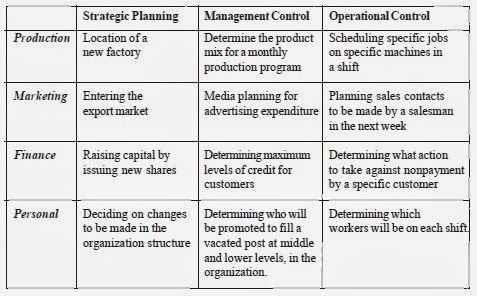 The Table-2 below depicts these characteristics and highlights the substantial differences in information required for strategic planning, management control, and operational control. 1. Intelligence: This is the stage in which the decision maker recognizes that there is a problem or opportunity that requires him to make a decision. 2. Design: The decision maker determines the alternatives that are available to him to resolve the problem or exploit the opportunity. 3. Choice : In this stage, an alternative generated in stage-2 is singled out to be pursued. The selection process may involve feasibility analysis or cost-benefit analysis. With this framework, we can distinguish between three major classes of decisions. a) Programmed Decisions are there in which all stages are handled by following a preset well-defined procedure. The decisions are repetitive and routine which arise often and are capable of being modelled mathematically in their entirety. The classic example would be inventory-ordering decisions. b) Non-programmed decisions are difficult to structure in logical mathematical terms. These decisions cannot be handled in well-defined and pre-specified procedures. These opportunities are not repetitive in nature and they require fresh intelligence, design and choice phases to be executed. An example would be the decision to set up a new factory or launch a new line of product. c) Semi-programmed decisions are those in which at least one and no more than two of the above stages can be handled by well-defined preset procedures. An example where the intelligence phase is well structured would be the diverse kinds of variance analysis. A comparison with a budget or standard is undertaken in a well-defined way to signal the need for a decision. Subsequent stages of design and choice, however, are not handled by a set procedure. Recall that an MIS support problem-specific decision-making. Depending on the framework used by the organization for decision-making and goal set for MIS, the designer should determine the information needs. An MIS should not automate the existing procedures. MIS should act as a catalyst of change in the processes of an organization. For instance, a private bank sanctions loans by using a sequential process. An applicant applies for a loan, the details provided by him are verified, and his application details are entered into the bank application format along with his credit limit. The computer application is then passed on to the loan sanctioning authority. The process takes two weeks time even though the staff spends about thirty minutes on the application. A workflow system should not automate the existing process. It should aim to reduce the application processing time to less than a week. The present workflow systems let everyone look at the application simultaneously and each concerned person adds his feedback. The sequential process has been changed to a parallel process. The total time has come down to less than a week. An MIS should be designed viewing the organization. A company’s structure subdivides essential tasks to be performed, assigns them to individuals, and spells out the interrelationships of their tasks. The organizational structure and the tasks determine the information needs of the company. The MIS designer must plan to deliver reports in line with the organization structure. This means that the main decision makers and the power centres must be recognized in the MIS. If the decision-making responsibilities are clearly defined and allocated in the organization, MIS must capture them. If the organization culture provides sufficient incentives for efficiency and results, the MIS support this culture by providing such information, which will aid the promotion of efficiency. The organization system is an open system and MIS should be so designed that it highlights the changes to the concerned level in the organization so that the action can be taken to correct the situation. The designer of the MIS should take care of the data problems. The input data to the MIS may contain bias and error. The inputs to the MIS must be controlled to ensure impartiality, reliability and consistency. If the organization culture provides sufficient incentives for efficiency and results, the MIS should provide information that will aid the promotion of efficiency. If the organization is an open system then MIS should be designed to highlight critical changes in the system or in its environment. In designing an MIS there are two types of situations one may come across. If the organization has no experience of computing applications, which will create the maximum impact on the organization, it can be identified by using Zani’s framework. Key success variables are however seldom obtained through a questionnaire survey of managers. Data on environment, past company performance must be analyzed and discussed to identify key success variable. It is sometimes useful to pen down a quantitative measure of such variable. For example the performance of a textile unit can be summed up through two indicators: contribution per loom shift and fixed cost per loom shift. Similarly the performance of a shipping company may be measured as gross operating profit per day per voyage. Precise definitions of performance indicators enable the analyst to understand and quantify the likely impact of improvement in different task of planning and monitoring. An analysis of the company’s key success variables can be done only after a thorough understanding of the company’s operations. Consultants and vendors who do not spend adequate time in understanding the operations are unlikely to throw up application areas, which will create the maximum impact. They are likely to suggest “off-the-shelf” applications. One should use standard software, which is available for such applications. For a company getting into computerization for the first time, a list of applications would have to be generated, keeping in view a 4-5 year perspective on the basis of which a suitable configuration would be decided. However the development and implementation of the applications would have to be done in a phased manner. The first few applications must be those, which can create an impact on the performance of the organization, are quick to implement with the least amount of changes in the existing procedures and systems. Initial success can make the later implementation of complex and more involved systems easier. For organizations, which have been into data processing and would like to graduate to MIS, the choices are somewhat limited. Existing computer technology, manpower, and past experience with computer applications etc., all such factors will condition the future growth of MIS. By and large an effort is made to create useful databases, which capture data during the execution of routine data processing systems. Such data are then analyzed to produce periodic planning report for monitoring. Examples of such systems are the sales analysis based on invoice processing; inventory control based on stock accounting; costing and profitability analysis on the basis of financial accounting system. Marginal additions to data fields, new coding structure, and revised procedures are introduced to make the data base and reporting more useful. 1) Involvement of top management in the computerization effort, in defining the purpose and goals of computers within the organization. 2) Selection of an EDP Manager who has the political skills to involve managers in choosing application areas, identifying information needs and designing reports. 3) A computer staff, which has interdisciplinary skills in computers, management, and operations research. 4) A balanced expenditure on hardware and software.